4x Airco de Havilland DH9, 1x Airco de Havilland DH4, 3x Rumpler C-IV, 3x Farman F-60 Goliath, 1x Ansaldo A 300-C, 4x Blériot Spad 33, 1x Handley Page W.8b, 4x SABCA-Handley Page W.8b, 10x SABCA-Handley Page W.8f, 1x SABCA-De Havilland DH .50A, 1x SABCA SD.2 Sport, 2x Fokker F II, 1x Fokker F VIIa/3m, 1x Fokker F-VIIb/3m, 28x SABCA Fokker VIIb/3m, 4x Westland P-1 Wessex, 1x Savoia Marchetti S.73P, 4x Savoia Marchetti S.73, 4x Savoia Marchetti S.83, 2x SABCA-Savoia Marchetti S.73, 5x SABCA-Savoia Marchetti S.73P, 1x Junkers F-13L, 9x Junkers Ju-52/3mge, 7x Lockheed Lodestar, 2x Lockheed Super Electra, 2x DC3. 9x Sikorsky S-55, 10x Sikorsky S-58, 4x Bell 47, 1x SE Alouette II, 3x Westland-Sikorsky WS-51 + 1x WS-52 leased from Westland, 2x Vertol 44A leased from Vertol, 1x Sikorsky S-62 leased from Sikorsky. 47x DC3/C-47 (of which four leased from Sobelair + four from Belgian Air Force), 14x DC4/C-54 (of which one leased from T.A.I. and one from Sobelair), 19x DC6 (of which one leased from Belgian Air Force + three from T.A.I. ), 10x DC7, 7x CV240, 12x CV440, 3x L-1049 Constellation leased from Seaboard & Western, 1x Avro 652 Anson, 6x DH 104 Dove, 1x DH 114 Heron, 3x Caudron C.449 Goeland (presumable never operational), 3x Bristol 170 Freighter leased from Air Charter/Channel Air Bridge, 5x Fokker F27 of which one leased from BIAS via Sobelair, one from Fokker via Sobelair, one from Danish Aero Lease, one from LTU, 3x ATR72 of which two leased from Schreiner Airways and one from Gill Airways, 12x Dash 8 of which nine leased from Schreiner Airways + one from Hamburg Airlines + two from Tyrolean Airways. 11x Caravelle (of which one leased from Air France), 21x B707 (of which one leased from Sobelair + one from Trans Air + one from Zaïre Express + one from Occidental Airlines + one from Geminair), 5x B727-100, 16x B737-200, 6x B737-300, 3x B737-400, 6x B737-500, 6x BAC 1-11 of which two leased from British World and four from European Aircharter, 1x BAe146-300 leased from British World, 4x B747-100 (of which two leased from Air France), 3x B747-200 leased from Air France, 3x B747-300 of which one leased from Corsair, 13x DC10 (of which four leased from Lufthansa + one from Air Zaïre + two from Alitalia + one from World Airways), 7x A310 (of which two leased from Airbus and two from Lufthansa), 15x A319, 6x A320, 3x A321, 10x A330, 5x A340 (of which one leased from Airbus), 2x MD11 leased from City Bird. History: Société Anonyme Belge d' Exploitation de la Navigation Aérienne (SABENA) was formed by the Belgian government on May 23 1923 to succeed SNETA and act as the national flag carrier. They inherited part of their fleet: 4x Airco DH9, 1x Airco DH4, 3x Rumpler C-IV, 1x Farman Goliath, 4x Blériot Spad and 1x Ansaldo. On the day of its foundation the inaugural flight with a load of freight & mail went from Haren via Ostend to Lympne in the U.K. A couple of days later the first passengers flew with these ex bombers, but soon it was found that the airplanes were not suited for commercial pax transport and new equipment was found with the purchase of an Handley Page W8, later on more airframes were build in license by SABCA. With these machines the first scheduled pax service was established on April 1 1924 linking Brussels with Strasbourg, followed by Rotterdam (June 1), Basle (June 10) and Amsterdam (September 1). More license build aircraft followed, like the Fokker VII and Savoie Marchetti. With these airplanes and other new equipment an intra European and intra Belgian Congolese network was established. On February 23 1935 a once weekly scheduled link was established between Belgium and Belgian Congo. During the War European services were halted, but continued within the Belgian Congo. The postwar network expanded with war surplus DC3 and new DC3, DC4, de Havilland Dove and Convair 240 equipment, covering most of Europe, later extended to the Middle East and even as far as Johannesburg. Transatlantic services to New York started on June 4 1947 with the DC4. A big shadow came with the independence of the Belgian colony in 1960: the entire long haul fleet evacuated ten thousands Belgian citizens in July and afterwards Sabena had to withdrawn from its profit making services within Africa. Intra Belgian airmail helicopter services were started on August 21 1950. With these experiences, Sabena did open on September 1 1953 the world's first international scheduled pax helicopter service, linking the city of Brussels with Lille, Maastricht and Rotterdam. Later on more international destinations were added like Cologne, Bonn, Dortmund, Duisburg, Eindhoven and Paris. On November 1 1966 these money losing helicopter operations were suspended as conventional airport-to-airport services improved. A total of 400.000 pax were carried in 77.000 flying hours over a distance of 11.373.000 km . Afterwards contracts with smaller companies like BIAS, DAT, Publi Air, EAT were signed to operate on their "Common Market Commuter" services. DAT would become a major player in the history of Sabena: in 1968 the first regional services on their behalf; in 1986 taking a stake of 49,66%, in 1991 increasing to 76%. From 1996 on they became a wholly owned subsidiary and all aircraft ended up in the colors of the flag carrier. In 1949 Sabena took a major stake in Sobelair which gradually evolved into a subsidiary operating the non-IATA charters and IT flights. Their color scheme was always closely related to the mother company. Both "takeovers" were a smart move to liquidate internal competition. New piston equipment was bought in form of DC6 (1953), Convair 440 (1956), DC7 (1956). During the expo year of 1958 foreign equipment was leased: besides some helicopters, a DC4 and a couple of DC6's, the most interesting fact was the appearance of three Lockheed Constellations receiving the colors of Sabena. 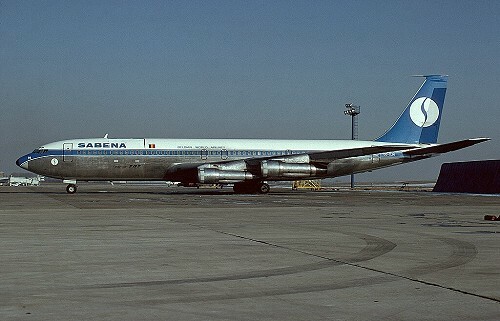 In December 1959 Sabena entered the jet age with delivery of their first new B707. On January 19 1960 first commercial service went from Brussels to Leopoldsville, four days later followed by transatlantic services to New York. Sixteen airframes saw life with the Belgian carrier, playing for twenty years a major role in the development of its medium to long haul network. From 1961 on the piston planes on its European network were replaced with ten Caravelles, accompanied with five B727-100 from 1967 on. Both jetliners were replaced with B737's from 1974 on, which formed the backbone on its European network till the late nineties when replaced with the Airbus A320 family. On the long haul sectors, two B747-100 were delivered in 1970, during the mid eighties replaced by two B747-300. Additional capacity for the medium to long haul sectors came by the purchase of five DC10 (three in 1973, + two in 1980) accompanied by three A310's (two in 1984 + one in 1986). The entire long haul fleet was replaced by A330/340s from 1996 on. Postwar color scheme changed six times. During 1951 the initial pure metallic colors with a blue cheatline evolved into a scheme with a white top. Afterwards the changes coinciding with the purchase of new equipment like the order of its first Boeing jet aircraft on December 28 1955 and delivery of its first Airbus A310 in 1984, or anniversaries like 1973 and 1998. During 1993 an updated livery was introduced, after SABENA became officially an N.V. adopting "Sabena" titles with the small characters. Sabena became a relative strong player in Europe and Africa, but remained rather small in the overseas sectors and the Far East. Throughout its existence Sabena was mostly confronted with poor financial results. Lack of enough capital and the influence of the State made it impossible to create healthy yields. On the other hand the same State would sponsor the company if needed, and this was in fact its entire life. Additional financial injection was sought by making alliances with stronger foreign carriers. During 1957 there were contacts with KLM, Lufthansa, Air France and Alitalia to create "Air Union". In the mid seventies there were talks with KLM and Luxair to form "Benelux Air". With an eye for privatization more attempts for alliances were tried. The one with SAS (1987) never materialized. With the second attempt during December 1989, paper company Sabena World Airlines came into being with support from KLM/British Airways (40%) & Sabena (60%). SWA would operate a hub and spoke system from Brussels. It lasted one year and disastrous financial results ended this contract already by December 31 1990. A third attempt came with Air France: on April 10 1992 a contract was signed and the French company took a stake of 37,5%. This would last two years, as Air France withdrew due to their own poor financial situation. On May 5 1995 a contract was signed with Swissair, taking a stake of 49% which would be increased to 85% by 2000, but history told this never happened. During 1997 it became a full member of the "Qualiflyer Group", meanwhile the network and fleet grew dramatically and an expensive contract was signed with City Bird to operate on some of the longer sectors. Overgrowth, persistent poor financial situation, mismanagement, recession in the aviation industry after the tragedy of September 11 2001 and financial troubles with Swissair led to concordat on October 5 2001 and finally to the bankrupt of Sabena on November 7 2001. Subsidiary DAT, renamed to SN Brussels Airlines and later Brussels Airlines would be the ultimate successor taking over most of the slots of Sabena.